I’m not sure what to think anymore. Really. Here are my questions. How can a person be unknown in his town but be well-known around the globe? And how can this mysterious person command top dollar? And how is it that he lives a block away and I’m just now discovering all of this? These are the mysteries of the universe. Let me introduce Steve Casino. He’s not a famous athlete, musician, or writer. He’s an artist. Well, toymaker. No, artist. No, toymaker. This is where things get blurry. This is his story in a nutshell. 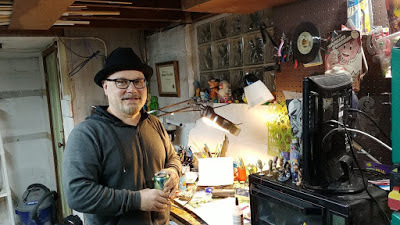 Steve Casino in his home workshop studio. A mutual friend introduced us so before our interview so I did the obligatory Google search. And, boy, was I blown away by what I saw. But, let’s back up a little. 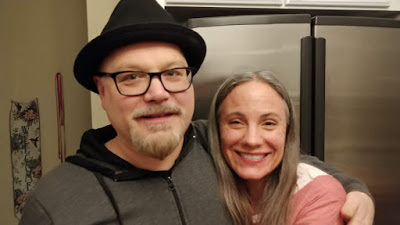 Steve and his wife Nicole are originally from Mercer, Pennsylvania but due to Steve’s work commitments to designing toys, they moved to Fort Thomas a handful of years ago, a place that they describe as being much like their home town in Pennsylvania - charming older homes, walkable, safe, accessible. When he wears his hat, Nicole describes her husband as looking like a saxophone player in a band. She giggles. I kind of see it. They make a sweet couple. By the way, he doesn't play sax. Casino studied Industrial Design in Rochester, New York and upon graduation went to work immediately in New York City. With each successive position he honed new skills that eventually led him to creating peanut people. Casino works for Bang Zoom toys, a Cincinnati based toy design firm. “I invent toys now….We do toys for Hasbro and Mattel. We are like a think tank. We come up with the idea and present it and then partner with them if they like it.” And they are pretty successful. So one day at work he noticed that a peanut looked like a colleague. “We have a lot of snacks at work. My friend sat two desks over and I drew that.” He points to the original peanut. “And I showed him. So I started drawing everyone at work. It was really funny. I started with caricatures. 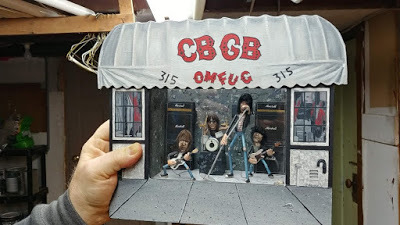 So I started making my favorite bands.” At this point he shows me a diorama of that early attempt, The Ramones at the CBGB Club, and it is impressive. The playfulness is the first thing I notice but then the details emerge. I have to admit that I was impressed with the artistic miniature mastery and whimsical approach. The Ramones by Steve Casino. Of his career, Casino says, “I’ve had so many jobs, that all of those skills have merged into this. My first job out of college, I made fake food for TV commercials. Back then they didn’t have computers so everything had to be done by hand. They were double the size for the camera. I went to college for industrial design in Rochester, New York. It taught me a lot of different things. So I moved to New York after graduation and got a job the first day because they just needed someone to sand wood.“ And he has been working and creating ever since. There were a couple of pieces on the work table. Casino had a few orders to fulfill. The wife of the Polish actor who voiced Sid from the movie Ice Age commissioned Casino to make a piece of her husband and of the character. That was going off to Poland the next day. He has made lots of commissioned pieces for weddings, retirements, and other life events. 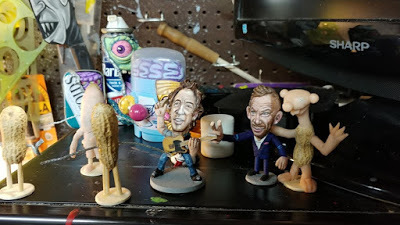 Peanut people in various stages of development. Casino says, “So, okay, I’ve done work for Planter’s [peanut company] but they hire me to do retirement peanuts for employees.…It was a more recognizable thing. 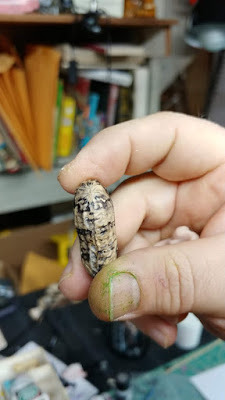 People see them and they still don’t realize it’s a peanut”until you look on the back side which reveals the peanut. Casino has appeared on a handful of national TV shows. I watched a clip of the hosts of Good Morning America mob him with questions. They were just about falling over each other as they peppered hm with questions. “I got a little tongue tied because those people talk so fast. They’re natural talkers and I’m not,” he says. And that’s true. He’s soft spoken and thoughtful about his responses. But his imagination is working overtime all of the time. He is always thinking of something to create - and it’s not always peanut people. And then there’s the royal wedding of Prince Harry and Meghan Markle. He was commissioned by a British almond milk corporation to make figures of the royal family to be used in a commercial. Instead of peanuts he used almonds. “It was really fun but it took like two months. It was on all of the networks during the wedding. They even showed me making the figures. It was kind of cool….They put me on their YouTube page.” Yeah, I’d say that's pretty cool indeed. Casino wanted to see how small he could paint. So he painted Tic Tacs. You know, the candy breath mint. 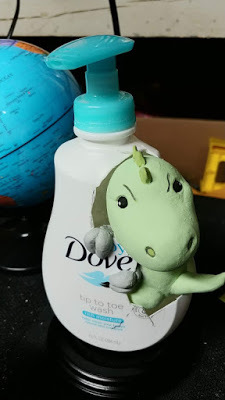 He taps a Tic Tac container and coaxes a particular one out. “There’s Van Gogh and there’s Starry Night on the back. This is an attempt to see how small I can go.” I examined it under the magnifying glass and all of the details are there. Amazingly small. He directs my attention to a piece on a table. “This is something I call Splinter Punk” a term he coined. It’s a 3D wood piece, bright colors, sharp angles, fun. 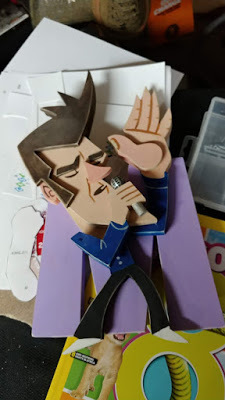 They are wooden caricatures like what he use to draw for magazines several jobs ago. I was like a kid in a candy shop. I was overwhelmed by all of the curious and interesting pieces casually laying about. These simple tools produce such wonderful creations. Then there are the pull toys. 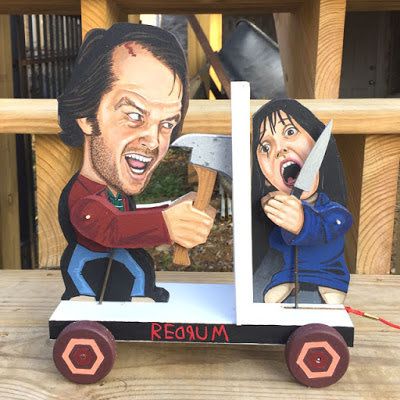 They are patterned after some of his favorite movies, mostly horror films. These are not designed for children. These are not miniatures. And they are delightfully quirky. In fact, they are pretty high end toys, but toy is not the right word because they are functioning works of art. For instance, the girl’s head on The Exorcist toy twirls as you pull the toy. The knife moves up and down on the Psycho toy. You can’t help but laugh and smile. In a few years his work has grown in sophistication and detail as an artist. “Basically, I have a lot of tenacity. A lot of people give up too early. It’s all about perseverance. I’m the tortoise, not the hare.” That should be on a t-shirt - Be the tortoise, not the hare. Yes, Steve Casino can rightfully claim to be the Number One peanut artist in the world. Who can dispute it? And that’s his story in a nutshell. Here's the link to Casino's webpage - http://stevecasino.com. Spend a little time exploring his work.